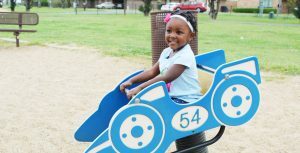 When Bossier Parish needs the rain and the Barksdale bubble lets a little through, what many might not consider is on rainy days the city offers plenty of things to do. From exciting indoor games to fun found in hobbies, the city offers events and spaces for families, locals and visitors to enjoy. Once in a while, you might want to consider just enjoying the wet weather. Grab the rain gear and head out to North Bossier Park. This park (4307 Old Brownlee Road) and many others have a splash pad that creates the perfect environment to enjoy the rain. Plenty of families utilize the park in the summer and bring their bathing suits to cool off. North Bossier Park has one of the best splash pads in Bossier City. There are games that allow you to squirt others with water and a tall bucket that dumps water on whoever is waiting below. If you aren’t into the splash pads just bring your gear and head out on a trail in the park to enjoy puddle sloshing. The walking trails around the park are a great way to get moving and make it a fun adventure out in the Bossier City landscape. 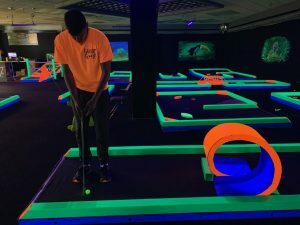 Lunar Mini Golf at Pierre Bossier Mall brings an unexpected challenge during rainy days. If you are highly competitive and choose to ignore the rain, one game at Lunar Golf will be the remedy to your cure any weather woes. The course is all indoor and covers 18 holes. The location inside of Pierre Bossier Mall, across from the Hallmark store, is completely illuminated with a black lights leaving everything glowing. The final hole is called the “prize hole.” Knight said this hole is the most challenging. If you win, you get a free game of golf another day. One of the best places to enjoy a rainy day is inside a world filled with stories. For this, Bossier Parish Libraries offer families opportunities to get out of the nasty weather and have some fun. During any day of the week, the libraries in Bossier Parish offer more than just books with each day bringing a new event. Check out their website for all of the daily events listed. All events are free and open to the public. For those with little ones craving a good book. Each Saturday from 11 a.m. to noon the Central Branch, located at 2206 Beckett Street, offers a story time. 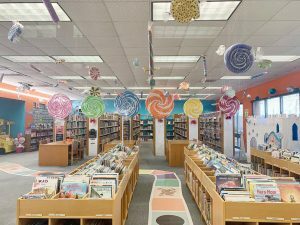 “We have innovative programs and events and with seven locations spread across the entire parish there is quite literally a library branch near you no matter where you are,” she said. The art revolution may start at the Bossier Arts Council but it is also where the rainy day blues end. Forget about the rain and stop by an art show any day on Tuesday through Saturday at the council’s location at 630 Barksdale Blvd. 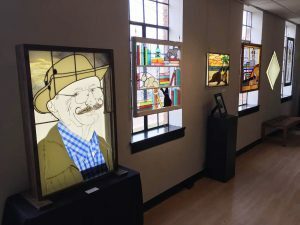 BAC is the exhibit space for some of the best local talent in and around Bossier Parish. BAC houses two galleries. The East Bank Gallery is the main display space featuring all original work by seasoned artists. The Emerging Artist Gallery is an opportunity for the council to showcase and assist local emerging artists who might not have an opportunity to display their talent. Each of the spaces open your eyes to so many different types of work. Beginning at 6 p.m. Feb. 8, be sure to catch the opening for the new show “Life and Legacies,” at the East Bank Gallery. This show is a dual exhibit featuring the works of Ed and Carol Allen paired with a reflection of Julia Raring’s life. The show runs through March 31 and is the perfect way to experience a rainy day. So, what are you waiting for? Don’t stay inside on a rainy day! Grab your raincoat and go explore what Bossier has to offer.